Polar bears have become the face of climate change, and for good reason -- the effects of warming temperatures have been most apparent in the Arctic, where melting ice is hurting polar bears' ability to hunt prey for their survival. But polar bears aren't just associated with climate change. Each December, The Coca Cola Company runs a winter-themed marketing campaign for its most popular soda using happy, healthy, Coca-Cola-loving polar bears in its ads. As we learn more about the devastating effects of climate change on polar bears, it seems unconscionable that The Coca Cola Company continues to use the animal in advertisements. Please join in demanding that the company stop by signing this petition. But climate change isn't the only threat to polar bears. In 2017, a team of scientists revealed that plastic pollution, like plastic bottles used by The Coca Cola Company, had become a major threat to the Arctic. They estimated that about 300 billion pieces of plastic were floating around the remote ecosystem. 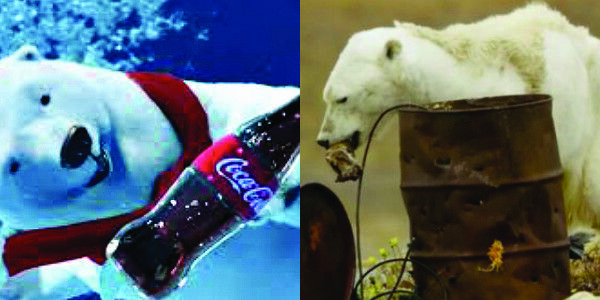 The Coca Cola Company plays a direct role in contributing to both plastic pollution and climate change, which combined are pushing polar bears to extinction. Please sign this petition, and let's demand that Coca Cola stop using polar bears in its tone-deaf ads.